Don't Walk -- Let's have it ! As a Brit, I always had something of a thing about the American traffic signs we’d see on TV series imported massively to our screens. In England (and elsewhere in Europe) there is a green man and a red man, the green man active and the red man standing still. It’s perhaps more universal and requires zero literacy. 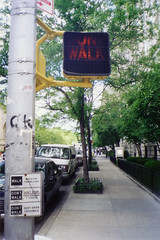 In the US the signs say “WALK” in green, and “DON’T WALK” in red. Yet in fact, you wish to cross the road. You could walk elsewhere without violating the sign – making me feel as if everyone should just stop walking near these signs and pay their reverence. When I was in New York, around 2002 on my way to Haiti, I snapped the first sign I saw. Here it is. Footnote: the observant among you (all three of you) will note I have taken Tweet resumés from the home page, so that it looks a bit more like an interesting place to read articles. Tweets are still available in the sidebar and the tweet week résumés can be read by RSS or by clicking the “twitter” category. This entry was posted on Saturday, May 1st, 2010 at 9:57 pm and is filed under general. You can follow any responses to this entry through the RSS 2.0 feed. You can leave a response, or trackback from your own site.